Nearly three quarters of small businesses suffered a security breach last year, according to the latest government figures. They reveal that the average cost to a small company of a major security breach is between £75,000 and £311,000. Two of our clients were recently targeted by ransomware, which has become a growing problem for businesses of all sizes. These malicious computer viruses encrypt your files unless you pay a ransom and can cause huge disruption to your business. Thanks to the backup systems we have in place, we were able to recover all our clients’ data. 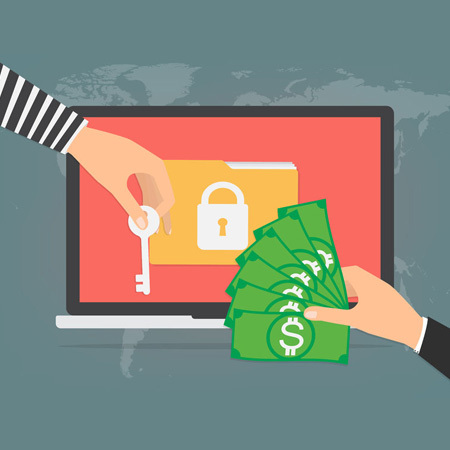 Ransomware has become hugely profitable for fraudsters which means they have large resources to develop increasingly sophisticated ways to gather information by exploiting security holes and tricking staff into divulging details like passwords. Phishing involves criminals sending out bogus emails which appear to be from legitimate organisations like your bank. They direct you to authentic looking hoax websites where you will be asked for your login or personal details. The majority of these emails now include ransomware but installing anti-virus software and backing up your data is not enough. Your IT security relies on layers of security to ensure the windows of opportunity for the fraudster are as small as possible. You also need to educate your employees that emails and websites may not be what they seem. If you do receive a suspicious email then make sure your staff don’t click on any links or open any attachments. Also change your passwords regularly and consider having a different one for different websites. In the past we would back-up clients’ data with a view to protecting them against hardware and disk failures. But the emphasis now is on having back-up systems that protect against ransomware, which is becoming a much bigger and more common threat. You need to ensure that you have the right back-up system in place which can’t be encrypted by the criminals. We are aware of cases where the disks used for backing up data have also been encrypted, so it’s important to consider the storage of your back-up and make sure it is protected. If you really want to be confident that your data is safe, however, you can use our secure, managed back-up service. We are continually introducing more rigorous security to reduce the risk to our clients posed by these ever-evolving online threats. But we also need your help to stay one step ahead of the cyber criminals. For more help with improving your business’s data security, call our friendly experts on 01225 636000, or email support@priorityit.co.uk. Also, you can forward any suspicious emails to us at support@priorityit.co.uk and we will check them for you.